This 4-day workshop is an introduction to the history, identification, and preservation of photographic materials. 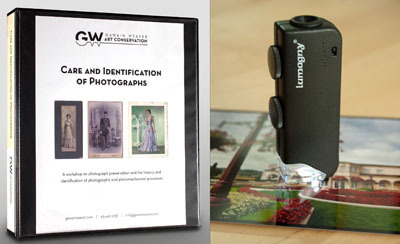 Participants will acquire hands-on identification skills and learn practical photograph preservation techniques. Using handheld 60x microscopes and a large set of photographic and photomechanical samples, they will learn how a variety of processes were created, why they look the way they do, and how they deteriorate. Knowledge about photographic processes is essential to their preservation and leads to a greater appreciation of the aesthetics and history of photographic prints. Preservation topics include enclosures, handling guidelines, environmental monitoring, the effects of temperature and relative humidity on collections, and the importance of cold storage for certain photographic materials. Processes examined in detail include but are not limited to the following: daguerreotype, albumen, collodion and gelatin printing-out processes (POP), matte collodion, gelatin silver, photogravure, offset litho, letterpress halftone, collotype, chromogenic color, inkjet, and dye sublimation. Group ID sessions, using a digital microscope and screen projection, will allow participants to practice their identification skills in a guided setting. A 240-page workshop notebook (printed in color) and a 60x handheld microscope w/LED light is given to every participant to take home. The Basic Photographic Sample Set, consisting of 18 identified photographic and photomechanical processes, is available at the time of registration for $75. The price for the Sample Set without workshop registration is $175. The American Society of Appraisers, the International Society of Appraisers and the Appraisers Association of America will award 24 reaccreditation hours/professional development/continuing education credits for qualified appraisers attending this workshop. Full Refund if requested up to 3 weeks before the workshop. 50% of the fee will be refunded if requested between 3 weeks and 1 week before the workshop. If the refund is requested more than 60 days after initial registration AND payment was via Paypal a $30 fee will apply due to Paypal policies. Cancellations made within one week will not result in a refund. Should the workshop be cancelled for any reason, full refunds will be made. This workshop is hosted by the UCLA Library Special Collections (Los Angeles, CA). Full-time students qualify for student registration. E-mail a current student ID and the degree program in which you are enrolled. If you would like to pay by check, or have any questions, please call 415-446-9138 or e-mail: info@gawainweaver.com.